Pamper your skin with high quality Ayurvedic care for a pleasant balance. Increased skin sensitivity can be caused by many external stimuli, such as climate, seasons, air pollution, UV radiation, or individual circumstances, such as stress and nervousness. When the skin loses its balance, it usually responds with dryness, feelings of tension and redness. Maharishi AyurVeda Pitta Care Cream is specially tailored to the needs of sensitive, irritation prone skin. Enjoy specially selected Ayurvedic herbal extracts in a cream base with camellia seed oil, olive oil and shea butter. For a luxurious experience use our Pitta Care Cream and feel your facial skin becoming supple and soft. Natural Ylang Ylang Aroma Oil leaves a pleasant fragrance. A cream made from natural oils, with selected plant extracts. It gives the felling of harmonious well-being, even to sensitive skin. Rich skin care for sensitive skin with specially selected Ayurvedic herb extracts in a soothing base of camellia seed oil, olive oil and shea butter. After cleansing in the morning and evening, apply sparingly to skin that has been treated with Maharishi AyurVeda Aloe Vera Gel or Skin Refresher or to damp facial skin. Due to the high content of natural oils, it is possible for a thin layer of oil to form on the surface of the cream. This in no way impairs the quality of the cream. Maharishi AyurVeda Pitta Care Cream is specially tailored to the needs of sensitive, irritation prone skin. 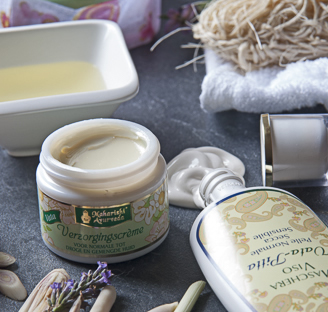 Enjoy specially selected Ayurvedic herbal extracts in a cream base with camellia seed oil, olive oil and shea butter. For a luxurious experience use our Pitta Care Cream and feel your facial skin becoming supple and soft. Natural Ylang Ylang Aroma Oil leaves a pleasant fragrance. Conforms to BDIH standards.